Barcelona suffered a shock home defeat by newly promoted Alaves as manager Luis Enrique left Lionel Messi and Luis Suarez out of the starting XI. Brazilian forward Deyverson silenced the Nou Camp when he stabbed home Kiko Femenia's cross from seven yards. Defender Jeremy Mathieu headed the equaliser from Neymar's corner. Ibai Gomez scored the winner - beating debutant keeper Jasper Cillessen from just inside the area - soon after Messi came on for the La Liga champions. Suarez was introduced after Gomez's goal but Alaves hung on to claim a first league win at the Nou Camp since 2000. Barca are three points behind leaders Real Madrid, who beat Osasuna 5-2 earlier on Saturday in Ronaldo's first game back from injury. Enrique appeared to have one eye on Tuesday's Champions League home group game against Celtic, making seven changes to the team that won 1-0 at Athletic Bilbao before the international break. As well as forwards Messi and Suarez, midfielder Andres Iniesta started on the bench. Although Javier Mascherano, Sergio Busquets and Neymar were included, Barcelona produced one of their poorest performances for some time. Even after Mathieu's equaliser in the first minute of the second half, Barcelona continued to live dangerously as Alaves' Edgar Mendez had a goal ruled out for offside. Mathieu blasted wide of an open net before Mascherano was caught out on the edge of the Barcelona penalty area and Gomez wriggled free to slot into the far corner. Match ends, Barcelona 1, Alavés 2. Second Half ends, Barcelona 1, Alavés 2. Attempt missed. Lionel Messi (Barcelona) left footed shot from the centre of the box is close, but misses to the right. Assisted by Lucas Digne. Attempt missed. Lucas Digne (Barcelona) left footed shot from outside the box is too high. Assisted by Aleix Vidal. Attempt blocked. Javier Mascherano (Barcelona) right footed shot from a difficult angle on the right is blocked. Assisted by Neymar with a cross. Corner, Barcelona. Conceded by Víctor Laguardia. Offside, Barcelona. Lionel Messi tries a through ball, but Neymar is caught offside. Foul by Cristian Espinoza (Alavés). Attempt missed. Andrés Iniesta (Barcelona) right footed shot from outside the box misses to the right. Assisted by Javier Mascherano. Corner, Barcelona. Conceded by Vigaray. Substitution, Alavés. Víctor Camarasa replaces Ibai Gómez because of an injury. Offside, Alavés. Fernando Pacheco tries a through ball, but Edgar Méndez is caught offside. Foul by Ibai Gómez (Alavés). Substitution, Alavés. Vigaray replaces Kiko Femenía because of an injury. Substitution, Alavés. Cristian Espinoza replaces Edgar Méndez. Substitution, Barcelona. Luis Suárez replaces Paco Alcácer. Deyverson (Alavés) wins a free kick on the left wing. Goal! Barcelona 1, Alavés 2. 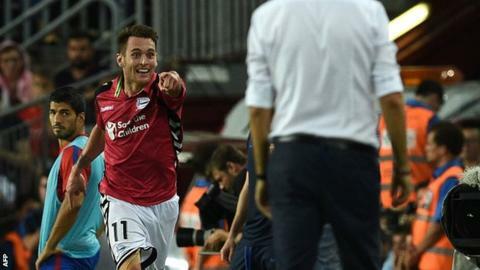 Ibai Gómez (Alavés) right footed shot from the centre of the box to the bottom right corner. Substitution, Barcelona. Andrés Iniesta replaces Arda Turan. Edgar Méndez (Alavés) wins a free kick in the defensive half. Attempt missed. Lionel Messi (Barcelona) left footed shot from outside the box is high and wide to the left from a direct free kick. Foul by Daniel Torres (Alavés). Corner, Barcelona. Conceded by Raúl García. Corner, Barcelona. Conceded by Edgar Méndez. Substitution, Barcelona. Lionel Messi replaces Denis Suárez.